Long before cancer and years before I had become a yoga instructor, I had been a visual artist who was moved to go much deeper into her yoga practice. As I did, I started to realize that certain absolutes to which I had subscribed at that time no longer seemed to make energetic sense for me. Things weren’t matching up and everything felt so confined and needing to bust out. As a result, my love for art making became less joyful as I prepared for the next exhibition, or application processes. The graphic design / marketing job, and industry that once provided just enough creativity in exchange for justifiable income to primarily support my life and art work, was in great conflict with some very basic beliefs that I held dear. The office in which I worked grew more limited and negative in ways that didn’t work for me, and my art was craving a move off of my canvases and into the world. While greatly influenced and anchored in my philosophies from my childhood in Southern Minnesota, as well as my living and working in New York, I was being called higher, to grow stronger, become more myself and much more defined. I understand now that I am firmly on the path to mature as both a creative and a healer. And those paths are becoming more and more one. I love the texture of things that have history: fossils, tree bark, aged skin and weathered paint and urban walls that have been layered with posters and graffiti and signage. I have a thing for rusted metal, old tools and anything that displays age—experience. Each of these things hold the evidence of life or of time. In all weathered things, I see the efforts that people are always making that much too often go unnoticed, un-championed and un-rewarded by anyone —especially SELF. This is historically endless, as well as emotionally and psychologically layered. The previous layers remain visible. This is LIFE. The evidence of the past are the bread crumbs and markers that in some way not only color the present and future, but show us the way when we need to back track and gain perspective in order to understand where we are. Originally expressing this idea in transparent veils of paint, I gradually changed my artistic medium as it evolved towards denim. Worn denim is such an icon that has become intimately woven into our lives. It is texture, content, context, color and mood. In it, I have come to appreciate the subtle traces of life that are left behind in the way we each wear out our jeans. Denim in blue—the archetypal color for mother, comfort, nurturing and healing, is connected to Genoa, Italy where jean material was created in the 1500’s for use as work clothes and bedding. Revolutionary in its connection to industry within the United States circa 1850’s, denim has always been deeply rooted in cotton and indigo production, factory work, labor concerns and rural and urban identity. Over time, it has been used by women to subdue or shield femininity. Denim pants have for years, referenced economic status, civil rights, gender equality, age appropriateness, and the need, or desire for women to defend themselves with protective clothing—(and in some cases express sexuality that is less overt and more on edge). 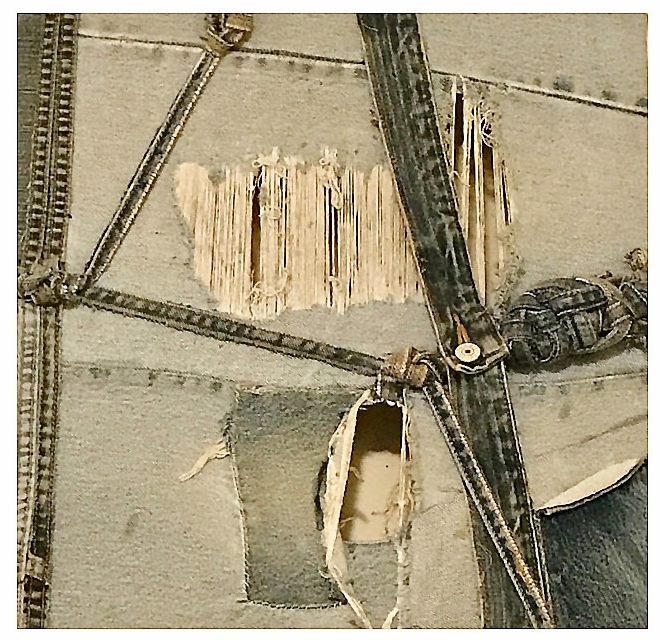 We all wear jeans and my dissected denim fragments are building blocks of symbolic structures to relay the equality in human-ness that we all are. As such, the evidence of human experience was and is still my muse. I felt that the work on my ‘canvases’ was intended to bleed off and out into a fourth dimension which for me, serendipitously became my inspiration to support others through yoga. As I began to shift my focus from expressing myself as an exhibiting visual artist, since cancer, I’ve naturally fallen back into incorporating the things that artists work so hard to establish in order to make works of art. The absolute need for peace, time to think and to see, learn and to question, as well as time to be inspired are all paramount. If one is lucky, one could inspire others a little as well. To teach yoga and guide students into the appreciation and wonder of their own efforts and intentions, has also become my path towards self care pre- and post cancer. To acknowledge one’s own journey is one of the most important discoveries one can make. Similarly, it was not until Dorothy consciously placed her own feet on the yellow brick road that she had any concept or comprehension of beginning to find her way home. However, as she traveled on that path she was completely unaware of the encounters that would force her to grow and learn along the way. Likewise, by placing my feet on the path towards health via cancer treatments, yoga practice, artistic living and championing the validity, necessity and importance of my own efforts has helped me to get on my own yellow brick road. Even now, as I reconnect with my natural tendency and creative path, I am better equipped and able to begin recovering my personal power and sense of ‘home’ in my new body. While along this portion of my own creative journey, the challenges, victories, lessons and self reflection are here moulding me every step of the way and setting me free.